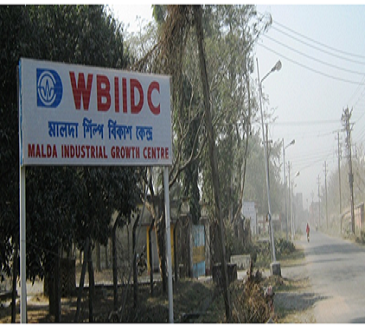 Malda Industrial Growth Center was established in 1982-83 in the Malda district of West Bengal. The site is located 10 km away from the Malda town along the National Highway - 34 towards Raigunj.It is classified into two phases which are located on either side of National highway - 34. 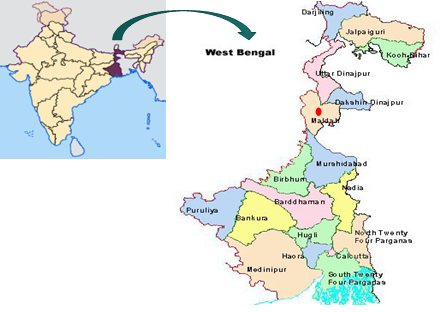 Malda is the district headquarter of Malda district and lies to the Southern fringe of North Bengal. Food processing, Cold storage, agro farming, and fishery are the major industrial activities in this region. The site is connected by National Highway 34 which connects Malda to Kolkata city as well as districts like North 24 Parganas, Nadia, Murshidabad, Uttar Dinajpur etc. 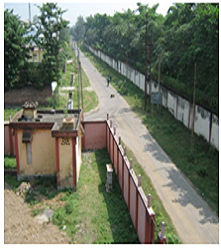 The nearest railway station is Malda station which is about 8 kms from the Growth Center. The closest sea port is Kolkata which is at a distance of about 368 km to the Growth Center. Nearest airport is at Bagdogra, located at a distance of 224 kms from Malda. The closest major airport is Kolkata, which is about 360 kms away from Malda town. The Growth Centre is providing lease holding to various industrial units for setting up their plants based on plan approved by WBIIDC. Pump houses - 2 in no. Paved Bituminous internal roads are providing facilities of entry and exit to all Industrial units within the Growth Centre. There are two approach roads as access routes for industrial units in the Growth Center. 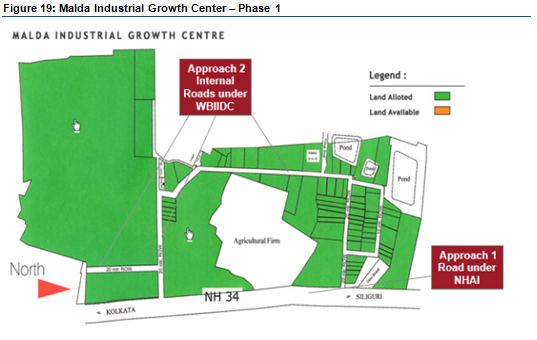 Approach 2 - This consists of all the internal routes of the Growth Center and is being maintained by WBIIDC. 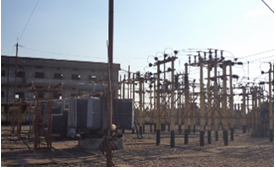 West Bengal State Electricity Distribution Company Limited (WBSEDCL) is supplying stable and quality power to the Malda Industrial Growth Center. WBSEDCL has set up a power substation in the Growth Center. WBIIDC has made requisite arrangements to ensure continuous water supply to the Growth Centre by pumping out ground water through overhead water reservoir. Since the industries in the Growth Center are majorly small to medium scale industries, they source their raw material from nearby locations and have their distribution centers in neighboring districts like Murshidabad, Birbhum, Bardhaman and Dinajpur. The raw materials are procured from and finished goods are dispatched generally to around less than 300kms.